Boston, Massachusetts, November 13, 2015 -- /EPR NETWORK/ -- Robin Reardon's seventh novel, Throwing Stones, explores what can happen when we make conclusions about others based on too little information, or on the wrong information. Whether we're misunderstanding each others' religions or each others' sexual orientation, everyone benefits from learning the truth. And everyone benefits from forgiveness. The release date is Friday, November 13, 2015. "All my books revolve around my motto," says Reardon. "And that is, the only thing wrong with being gay is how some people treat you when they find out. 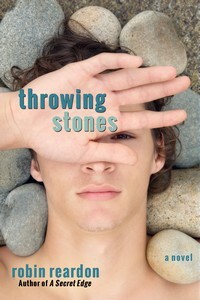 Throwing Stones takes that philosophy into religious differences. Jesse Bryce, the main character, is gay, and he falls in love with a Pagan teen from 'the village,' just outside his town. But his family and the other townies fear the Pagans for reasons they aren't sure about, themselves. Sound like any homophobic people we know?" Writing in first person from the viewpoint of gay teens, Reardon's style has an immediacy that brings readers right into the middle of the action. Her ability to speak directly from the mind of a gay teenage boy has been remarked upon by reviewers as uncanny and insightful. In Throwing Stones, there is something drawing seventeen-year-old Jesse Bryce toward the community of Pagans who live in "the village," just outside his rural Oklahoma town. Maybe it's that he has a crush on Griffin Holyoke, a tall, dark-haired boy with a tree tattooed all up his back. Or maybe it's that the Pagans accept Jesse for who he is, unlike his family—or his church, where he hears that being gay is a sin. After a man from the village is murdered while trying to prevent an assault on a girl from the town, Jesse's confusion at the town's unsympathetic reaction inspires him to set a mission for himself: to build a bridge of acceptance between the town and the village. As Jesse defies his parents and continues to visit the village, he witnesses mysterious rituals that haunt him with their beauty and intensity. And he falls in love with one enigmatic, mercurial Pagan who opens his eyes to a whole new world. Each of Readon's books introduces readers to topics with which they are unlikely to be familiar. Examples include life inside an "ex-gay" camp (Thinking Straight), the finer points of dog behavior (A Question of Manhood), and the effects of synesthesia and living with an autistic child (Educating Simon). Throwing Stones will have readers investigating power animals, standing stones, scrying, and rock hounding; with this new book, Reardon does not disappoint. Robin Reardon's website (robinreardon.com) includes her blog, "And now, this," which covers a wide variety of topics that relate to her philosophy as a writer and as a human being. She is available for podcast, blog, newspaper, and other media interviews.